Learn – or learn more – about the full schedule of events for this unforgettable evening! 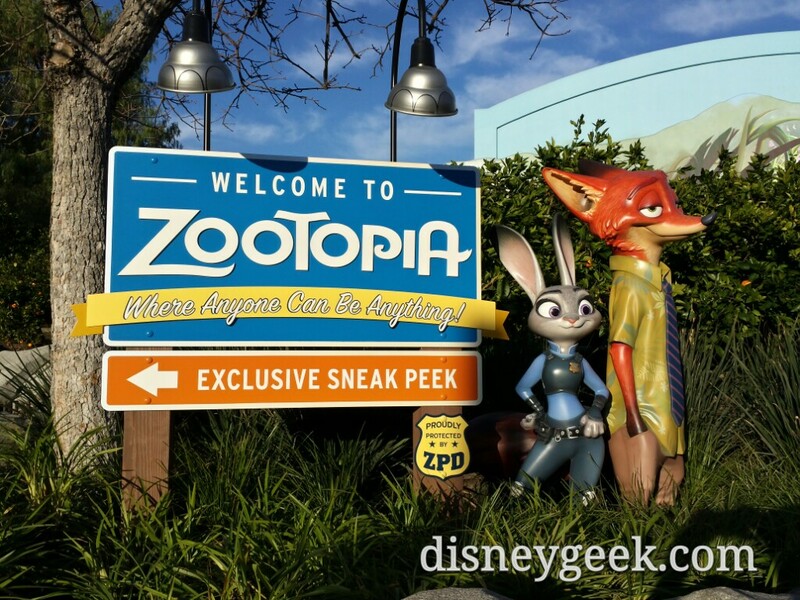 Today, Themed Packages for the Disney FanDaze Inaugural Party go on sale. Let’s take a closer look at some of the highlights of this event – sure to be the most FAN-tastic of the year – which will take place on 2 June. Featuring unique shows and unforgettable encounters with rare Characters including the introduction of a never-before-seen Disney Character! This is THE event to celebrate Disney fans while enjoying special access to Walt Disney Studios Park®. Ortensia, dearest friend of Oswald the Lucky Rabbit, will make history by joining the Disney FanDaze VIP family! We recently teased that fans would be able to meet over 50 Disney Characters, some of them for the first time ever. They range from the well-known – VIPs with brand new costumes – to the most rare, like Horace Horsecollar, Clarabelle Cow and Clara Cluck. Guests will also be able to meet Sulley, Boo, and for the first time ever at Disneyland Paris George Sanderson and Needleman from Monsters Inc., Joy and Sadness, Bolt, Duffy and ShellieMay, Kuzco and Kronk, Quasimodo and Esmeralda, Elena of Avalor, Gauchito, Burrito, and the beautiful Yaya from The Three Caballeros. Disney FanDaze Inaugural Party will also feature an exclusive reunion with friends from the Disney Afternoon. Your pals from Darkwing Duck, Goof Troop, TaleSpin and Chip ‘n Dale: Rescue Rangers will be delighted to pose for a snap with their favourite fans. Characters from Hercules, Atlantis: The Lost Empire, Treasure Planet, and even some of your Big Hero 6 friends will be all over the park and excited to meet with you during the Disney FanDaze Inaugural Party. This year marks the release of Disney•Pixar’s much-awaited Incredibles 2. On this occasion, our favourite super heroes Mr. & Mrs. Incredible will meet guests at the Art of Disney Animation during the Inaugural Party. What’s more, and for the very first time at Disneyland® Paris, Frozone will be there and ready to chill with his fans alongside his Incredible friends. For the first time ever, witness around 16 Disney Heroes and Villains such as Hercules and Hades, Li Shang and Shan Yu, facing off in the heart of Walt Disney Studios® Park. You better keep your camera and phone close, because you never know when an amazing photo opportunity will arise. You won’t want to miss the Dance your DuckTales Parade. Featuring all your favorite ducks, including Scrooge McDuck, Huey, Dewey, Louie and Launchpad McQuack flying in on their Hot Air Balloons from Duckburg, while more than 40 performers bring the streets to life! If you’re looking to make incredible memories, this quacking good time in the street is sure to fit the bill! This nighttime spectacular will undoubtedly be the highlight of the party. Don’t miss Max’s big debut as he shoots for superstardom on the Production Courtyard stage, completely re-themed for this magnificent concert. Max in his stunning new outfit is totally in charge of his own smashing line-up. He’s got bright lights, awesome music, mega sound, cutting-edge video, a rockin’ dance crew, and cool friends dropping by! With more than 30 new outfits created especially for this show, Judy Hopps, Kuzco, and even Stitch will be there to rock your night with Max! Oswald is coming to Hollywood Boulevard in the Roaring Twenties and introducing his dearest friend Ortensia! This is THE big news in town, and they will surely be followed by photographers, reporters and enthusiastic newsboys! For one night only, you’ll have the chance to be the brightest star on one of the most famous stages in Walt Disney Studios® Park: Animagique Theater. Warm up your vocal cords for a magical Sing-Along contest. It’s guaranteed to be a great time, and if you hit the right notes, you could win some exciting prizes including the chance to rub shoulders with Oswald and Ortensia! Guests will savour unique flavors from original menus created just for Disney FanDaze and served up at restaurants and gourmet kiosks, while exclusive limited edition merchandise is sure to delight the most dedicated of Disney collectors. The Disney FanDaze Inaugural Party is an event that promises to be like no other – a dream come true for all Disney fans, with surprises at every turn and a succession of unforgettable moments to enjoy together. Themed Package reservations are now exclusively open through our Reservation Center. Classic Packages will be released on January 22. For realtime updates, follow @DisneyFanDaze on Twitter and Facebook, and check out http://fandaze.disneylandparis.com/ for the latest updates and announcements! Please note that the Disney FanDaze Inaugural Party takes place at Walt Disney Studios Park, and availability is limited (packages and tickets) to ensure an exclusive experience. *Participants will have unrestricted access to all other activities listed above.